When I purchased my condo in 2015, it had original fixtures from when the building was constructed in 1951. I designed the new layout, selected finishes & fixtures, worked with a furniture fabricator, and oversaw the construction in my home. 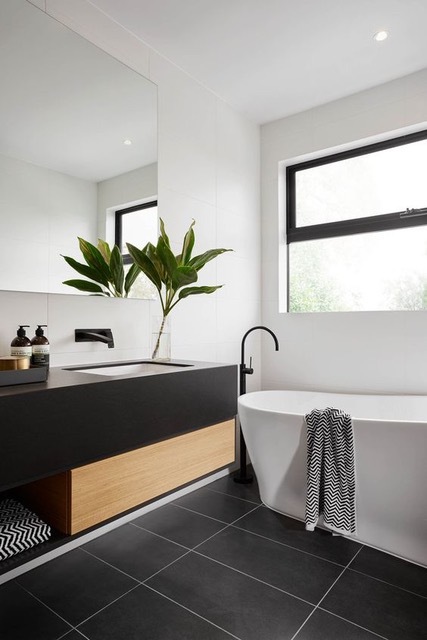 The final design optimized the small 6’ x 10’ space by moving the shower into a former closet, containing storage to the vanity and choosing wall-hung wc. Selected fixtures include Victoria + Albert IOS tub, Urban Timberworks Custom Oregon Ash vanity, Toto in-wall water closet, Brizo x Jason Wu faucets, Rejuvenation 36” round mirror, Color Cord lighting, Daltile floor planks and shower wall tiles, Ann Sacks penny rounds in the shower floor. The space also features electrical in-floor radiant heating and fan ventilation. I started with sketches and a few different designs in Google Sketchup and sent the models to general contractors for quotes. With an established budget, I walked down to our local plumbing supply to look at fixtures and sit in tubs. It was very important to me as the primary user to feature a deep soaking tub, or Japanese style ohuro. The shower was installed in what was previously a deep closet facing the bedroom. An in-wall toilet was selected to maximize clear space in front of the vanity. A freestanding toilet paper stand is not pictured. My aesthetic tends to be clean, simple, neutral colors with warm wood accents. For ease of cleaning, I chose a floating vanity, integral sink, and a dark slate grey floor tile.